Today is Bob Collins Appreciation Day. For what are we appreciative? 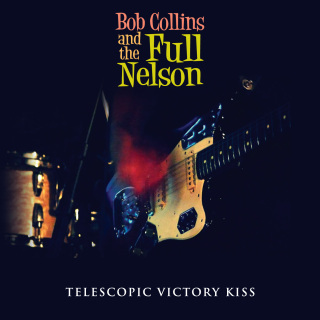 Most generally, for Telescopic Victory Kiss by Bob Collins and the Full Nelson. Specifically, we love the weathered by rich vocals, the songwriting that is personal and direct enough to have the lyrics stand for something, and the performance that passionately delivers the lyrics. But most of all, we are thankful for an album that is all about guitar pop, with no pretense to be anything else. The opening ringing guitar and rolling drums of opener "Sunshine Of Your Soul" sets the bar high, and the band achieves the standard for the remainder of the album. "Your Star Is Fading" and "Emily" follow the same approach of full-blooded arrangements with muscular rhythms and crunchy riffs. A few, such as "Espionage", "Golddust", and "Holy Man" showcase the band's ability to dial it back for a more reflective approach, and songs like "Seven Lives" display a mastery of power pop. "Shaking Down The Secrets" has a breezy, country feel. If you love guitar pop like we love guitar pop, we recommend this album. The band has decades of experience, but the result is fresh and vital. By way of background, Bob Collins was a member of the loved and defunct The Dentists. In the years since that band dissolved, Bob has continued to write and perform as a solo artist and with a couple of other musicians as The Full Nelson. Telescopic Victory Kiss presents his recent songwriting via a fully plugged in band. Astute readers may have noted that this is Bob's second appearance on this blog this month, as he played with fellow alum Mark Matthews on the Matthew's The Treasures of Mexico project (review here). Bob Collins and the The Full Nelson are Bob Collins (guitar/vocals), Rob Grigg (drums) and Mark Aitken (bass). Telescopic Victory Kiss is available via Jigsaw Records as a digital download or CD; see the links below.